Tom Gooding, Chair of the Valdosta-Lowndes County Chamber of Commerce, asked the school boards to do the Chamber's homework. He got no takers. 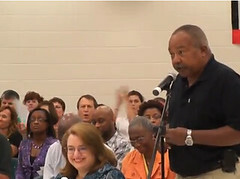 Reiterating the Chamber's demand from its letter of 9 September 2011, Gooding asked VBOE superintendent Dr. Cason at the 20 September VBOE forum to commit to meeting about what to do if the "unification" referendum passes. He said if the referendum passes, then the two school boards will sit down together. Dr. Cason didn't say anything about inviting the Chamber or CUEE to such meetings, since, after all, neither the Chamber or CUEE would have any legal role.